SHoP Architects proposed 475 West 18th in New York, uses extensive wood structural elements and other wood products and allows the team to set ambitious sustainability targets in the building's design, construction, and operation. Copyright image, permission for use. All around the world, including here in the United States, builders are adopting new, cutting edge technologies to save energy and reduce a structure’s carbon footprint. Now, technological advances are enabling architects and contractors to use one of the most traditional materials, wood, to construct lighter-weight, more energy efficient tall buildings. Today in New York, Agriculture Secretary Tom Vilsack announced two winners of the U.S. Tall Wood Building Prize Competition. The design projects, one to be built in the Chelsea section of New York City and the other in Portland, Oregon, were selected by a panel of architectural and engineering professionals and meet the competition’s criteria for safety, practicality and sustainability. The two winning design teams were granted a total of $3 million in funding to help support the development of the New York and Portland projects. The Portland building will be 12 stories tall, constructed of cross-laminated timber, and will house retail, office, workforce housing and community space. It will be built in the Pearl District. The project was submitted by Beneficial State Bancorp in partnership with Home Forward and LEVER Architecture. 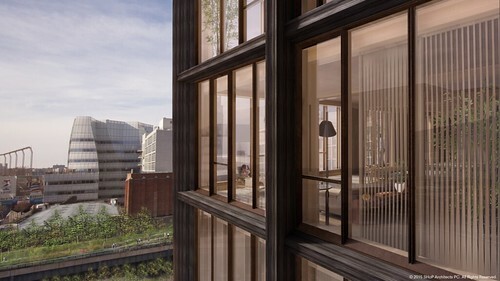 The New York winner, to be built at 475 West 18th Street, will be 10 stories tall, use wood structural elements, including those that are locally-sourced and include renewable products, and will reduce overall energy consumption by at least 50 percent relative to current energy codes. It was submitted by 130 134 Holdings LLC, in partnership with Spiritos Properties, SHoP Architects, and Atelier Ten. For the 12-story urban + rural ecological project in Portland, Oregon, Beneficial State Bancorp will provide site control to real estate developer project^, affordable housing investor Home Forward, and LEVER Architecture, for the proposed Framework as a redevelopment of their Pearl District property. The building is to be constructed primarily of cross-laminated timber (CLT) and will support a distinct blend of functions including street-level retail, office, workforce housing and community space. The main community space is designed to include a public Tall Wood Exhibit, featuring resources related to the realization and design of the building. This Tall Wood Building Prize Competition is yet another example of how a research and promotion board can support economic growth and, as important, promote development of new technologies that promote responsible environmental stewardship. 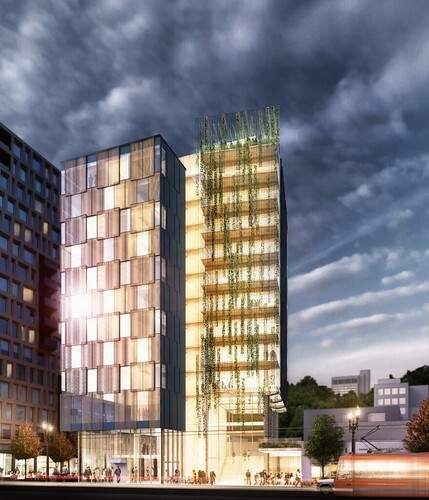 LEVER Architecture’s 12-story urban + rural ecological project in Portland, OR is to be constructed primarily of cross-laminated timber (CLT) and will support a distinct blend of functions including street-level retail, office, workforce housing and community space. Copyright image, permission for use. It's amazing to watch the leftist 'progressive' Global Warming Cult be led around by the nose, unable to think for themselves. 20 years ago they were screaming that we had to stop using paper grocery bags to save the planet. Now they are running contests to build the biggest wooden building, and demanding we go back to paper grocery bags. WOW, I still Don't get the wood high-rise? How can you make this safe for occupants? great design, great ideas - fireproofing details nightmare.